We caught up with Ambassador Cecelia, who answers some questions about her time in Florence. My favorite class abroad was “Florence Art Walks.” I expected this class to be going to the different museums in Florence and learning about the paintings and sculptures in each one. In reality, we literally walked all around Florence each week. Our professor went from time period to time period and showed us palaces, churches, and neighborhoods from each time. We learned about different artists and architects in Florence from Rosso Fiorentino from the Mannerism period to Filippo Brunelleschi from the Renaissance. My favorite place we visited in this class was the Basilica della Santissima Annunziata. Florentines have used this church since the Middle Ages but in the 17th century it was enlarged and completely redone in Baroque style. I loved this because of the coffered ceiling that is decorated with gold leaf. This was like a crash history, art, and architecture class all rolled into one and I miss learning little pieces of history about my city. Each block was crammed with all different time periods influences and by the end of the course, I loved being able to point out different things I had learned to my family when they visited. Piazzale Michelangelo has the best sunset view! You need to visit a winery in the Tuscan countryside! What felt the most “foreign” to you when you came back to the U.S? After spending so much time away from the states, I was surprised at how much felt the same. The things that felt the most “foreign” were so simple! 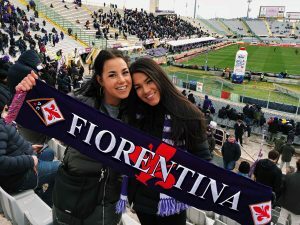 In Florence, we walked everywhere. I could count the number of times I had been in a car in Florence on one hand. I definitely miss being able to walk everywhere and I definitely forgot how expensive it was to fill up a tank of gas! One thing I can’t even put into words is how weird a US dollar looked after only using foreign currency for four months. Not only this, but being able to use my debit card everywhere again without worrying was a huge relief. I didn’t use my card once all semester as it would charge you every time and many foreign card readers are easily hacked, and that’s besides the fact that many shops and vendors didn’t even accept credit cards. In the U.S, its almost obsolete anymore for a business not to accept cards and that definitely took some getting used to again. 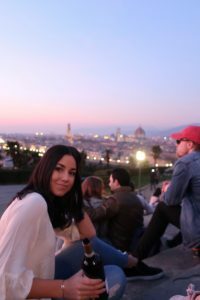 Cecelia was a spring 2018 SAI Florence student from the University of Tampa.